Guest conductor Vasily Petrenko led the Orchestre symphonique de Montréal (OSM) and pianist Jean-Yves Thibaudet Thursday evening in captivating performances of three mid-to late-19th century masterworks. The crowning jewel was Mahler’s First Symphony. 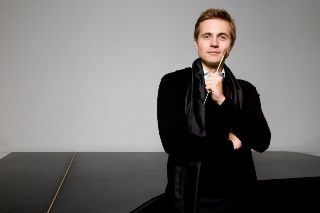 With detailed, precise and expressive gestures (his hand movements recalled those of his compatriot Valery Gergiev), Petrenko maintained tight control of the OSM’s augmented forces (which included two timpani, four trumpets and seven horns) to produce a soundscape of awesome proportions. They brought magisterial power to the blistering climaxes of the outer movements; a sustained and sombre atmosphere to the slow middle section of the first movement; a lilting, rhythmic beat to the “Ländler” folk dance in the second; and crisp, confident playing with impeccable phrasing to the “Frère Jacques” tune in the third (which included gripping solos from the principal double bass Ali Yazdanfar and oboe Theodore Baskin). The orchestra rarely sounded better. The string playing was sensational–deep, sonorous, always together. The trumpets and trombones were spot on–particularly principal trumpet Paul Merkelo’s delicately wrought solos in the first movement. The trumpets, trombones and tuba outshone the horns this time (the only weak spot) and the woodwind section played with verve and precision. The offstage trumpet fanfares were executed with panache and the horns, as tradition holds, stood for their last blast just before the symphony’s conclusion. I never experienced a more thunderous standing ovation in the OSM’s acoustically marvellous Maison symphonique. No less thrilling was Jean-Yves Thibaudet’s performance of Liszt’s Piano Concerto No. 2. His effortless technique permitted him to toss off with lightening speed the trills and arpeggios (without banging), and bring a moving lyricism to the quieter moments. His tone was soft, not bright, and the notes always clearly articulated. Cello principal Brian Manker brought burnished lustre to the melancholy solos in the second and third movements. The third and fourth movements whisked by with impassioned fury. As an encore Thibaudet played Brahms’ Intermezzo in A major, op 118, no. 2, probably unaware that Murray Perahia performed it in the same hall the previous week. Thibaudet played the work with grace and delicacy, but it sounded washed out and colorless compared with Perahia’s deeply probing exploration that brought out the music’s inner voices and depth of feeling. The concert opened with a fine rendition of Berlioz’s Le Corsaire Overture with equally impressive performances from all sections of the orchestra.